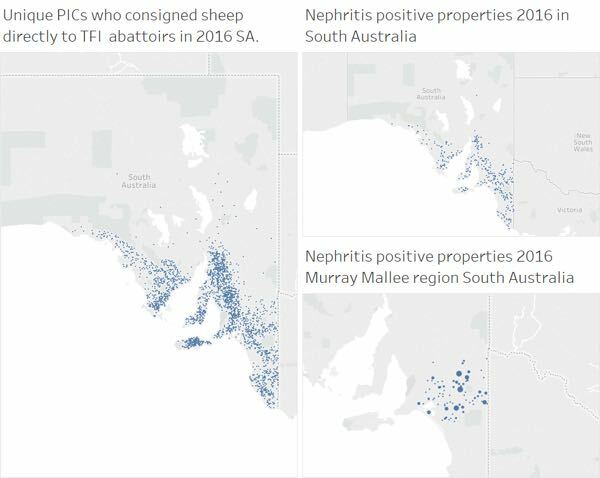 An apparently rising incidence of lesions described as “Nephritis” in lambs being inspected at two major abattoirs in South Australia led to a study attempting to define the syndrome, it’s costs to production (if any) and possible mitigations. A limited study has been designed in three parts to provide information, and hopefully conclusions that will be helpful to producers and Industry. This paper describes progress to date, and the plan ahead. Nephritis is a condition that inspectors report and the Murray Mallee area appears to have a higher incidence of these reports than other areas. 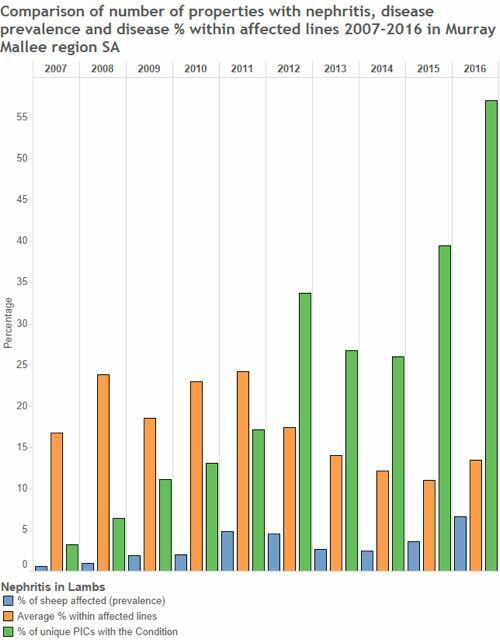 This area is semi-arid cropping and grazing country with average rainfalls between 250 to 400mm per year and there appears to be a rising incidence of these reports between 2015 to 2017. A brief study was designed to attempt to identify a case definition, causality and risk factors. What are inspectors seeing that is reported as “Nephritis”? 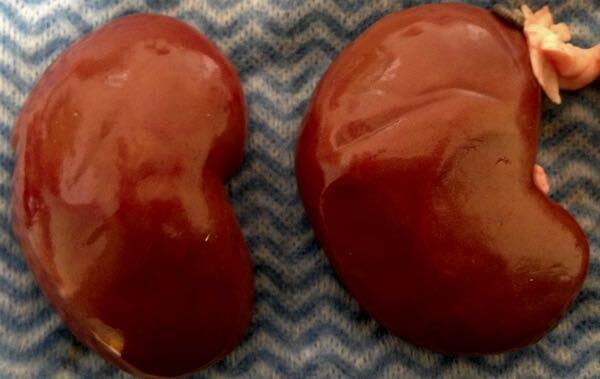 Is there a consistent pathology associated with these kidneys? From the pathology, is there a plausible aetiology for the condition? The study has 3 parts, and only involves lines of lambs. 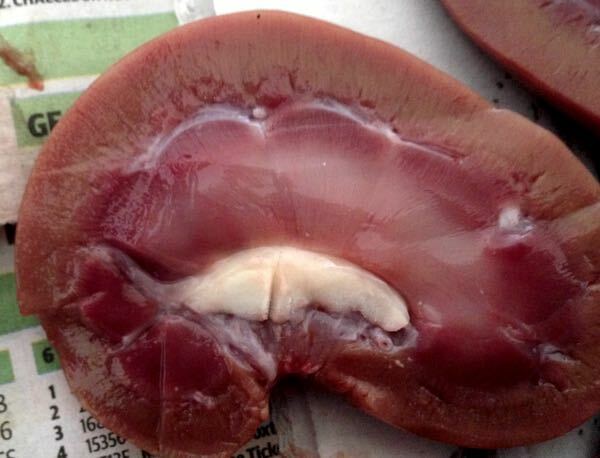 Part one involves identifying properties with persistently high reports of nephritis in lambs, gather some samples from kidneys identified as nephrotic, and determine the pathological lesions. This may assist in identifying risk factors or aetiology. Part two is interviewing producers with a standardised checklist to identify common factors & management processes and to look at the data to identify seasonal, spatial and other trends. Non affected producers in the same area will also be interviewed as controls. Attempt to identify production changes or losses, if any. Is this syndrome causing production loss in affected sheep, or could it in future (older) sheep? Is there an identifiable cause that could be addressed? What mitigations might be possible to lower the incidence? This will be published as a final paper to producers and the funding body for the EAS Program, the SA Sheep Advisory Group. 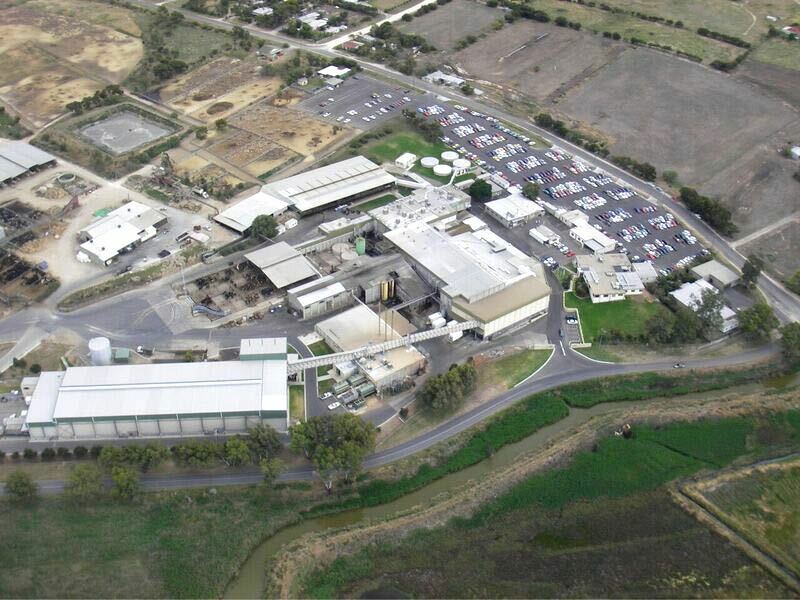 The project started with a single Mallee producer who received reports of “Nephritis” lesions in lambs consigned to Thomas Foods International (TFI) at Murray Bridge. The producer contacted PIRSA requesting assistance in determining the cause of these reports, and advice on how to reduce the incidence. The first step was to see what Inspectors were calling “nephritis” and to determine whether there was a consistent pathology. Lambs were sampled on 2 occasions by arrangement with TFI with results reported below. Recently - kidneys are usually swollen and may be discoloured or spotty. 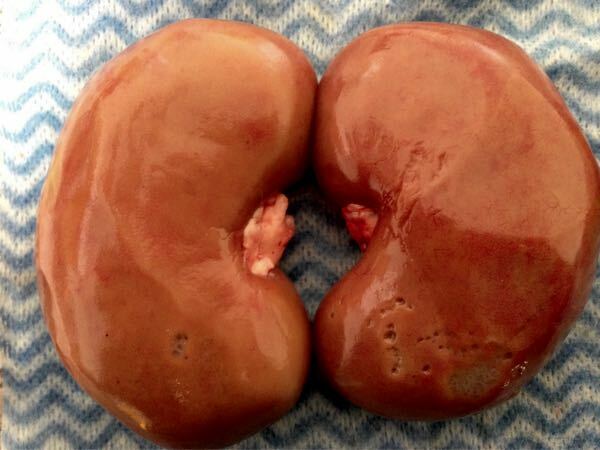 On collection of 42 affected kidneys on 10/10/2016, kidneys were grouped into classes (subjectively) of mild (1 or 2 very small white spots), medium (more than 2 white spots, some 3-4 mm in diameter) or severe lesions (large spots > 5mm, misshapen kidneys or visible cysts) and results are described below. Further samples will be obtained in coming months from producers identified previously with high incidence of “nephritis” lesions, and a standardised questionnaire is being developed. “Diagnosis: pyelonephritis & tubulointerstitial nephritis, multifocal, chronic, mild to marked, with interstitial fibrosis, lymphofollicular hyperplasia & focal abscessation. Comments: (partial extract) The chronic inflammatory lesions identified within the submitted kidney samples are essentially similar and suggest a spectrum from mild to moderately severe lesions, although, subjectively, there is not much difference between the kidneys grossly categorised as moderate vs.severe. These lesions are compatible with chronic pyelonephritis and multifocal areas of cortical tubulointerstitial nephritis. 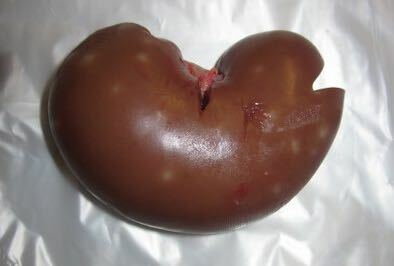 This likely reflects an ascending bacterial urinary tract infection with extension of the offending agent from the pelvis into the renal parenchyma. The consistent involvement of the renal pelvis (especially in the mild category, where there are few cortical inflammatory foci) suggests that haematogenous infection of the kidneys (i.e. embolic nephritis) is a less likely route of infection. 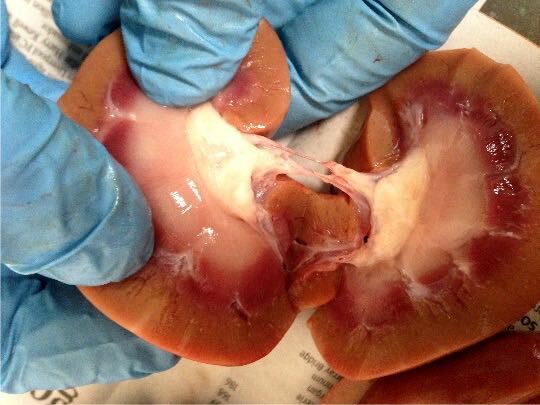 In one of the 'severe' kidneys, there is formation of a small abscess within the inner cortex. No specific inciting cause can be identified microscopically, i.e. no bacteria, fungi, parasites, etc. Leptospiral organisms were not detected in a fresh kidney sample tested by PCR; however, this does not fully exclude this as a potential possible agent. The study has been designed as a low cost, low input study with limited resources attempting to provide practical answers to producers who have identified an issue of concern. Farming is an increasingly complex and stressful operation, particularly in mixed enterprises and where producers are seeking to maximise growth rates and production, while minimising costs. The PIRSA EAS program has been very well received by SA producers and continues to be 80% funded by SA Industry, and is seen as delivering helpful, timely and good quality advice to producers, agents, and others engaged in Industry. The study, when it concludes, will hopefully be able to answer questions that concern producers, and if any production defects can be identified, will hopefully assist with recommendations. Reduced growth rate/weight loss – in cases of long term kidney damage. Can be significant. Deaths – may be sudden or after weeks to months of doing poorly (depending on cause). 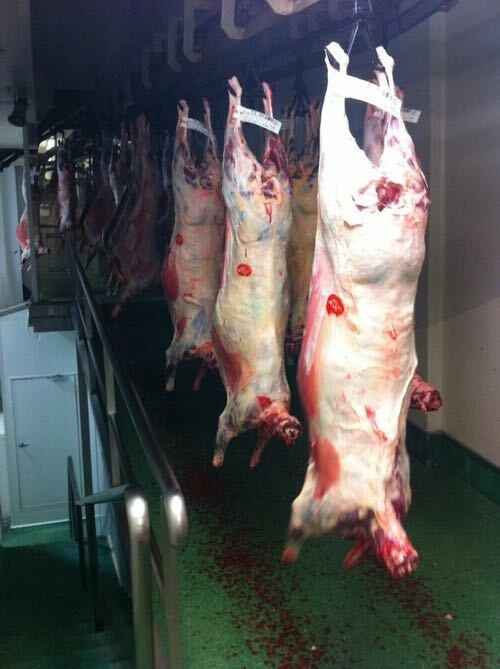 Kidney condemnations – affected kidneys are condemned (this is an industry cost as does not affect carcase weight for producers). Carcass condemnations – rare, associated with whole of carcass effects of kidney failure (e.g. fluid accumulation in the tissue). WHAT MIGHT BE SEEN ON FARM? Signs of nephritis will only be seen if 75% or more of the kidneys are damaged, kidneys have a large reserve capacity. If damage is significant decreased production, growth and/or death may be seen. If damage is mild then sheep may show no signs of illness or adverse production affects. Treatment will vary depending on the cause of nephritis and whether the problem is sudden or has developed over time. Sheep should immediately be moved (slowly) from known toxic plants. Use sharp and clean marking equipment - disinfect and change disinfectant regularly. Use a chlorhexidine based disinfectant e.g. Hibitane. Minimise the time lambs are held in yards and don’t overcrowd stock as this will increase faecal contamination of fresh wounds. Place lambs onto their feet when released from the cradle – again to avoid contamination of fresh wounds. Mark smaller mobs if possible (400 or less) so lambs can be moved back to their lambing paddock as soon as possible. Minimise/avoid lamb and ewe separation. Allow ewes/lambs to walk slowly back to their paddock from the yards and avoid driving which causes crowding and dust. Seek nutritional advice to ensure rations are balanced. Backgrounding is advised and gradually introduce rations over a minimum of 2 weeks. Quarantine newly purchased sheep for seven days; weeds will be easier to control in one paddock if they are inadvertently brought in. Feed hay/grain from known uninfested sources. Maintain competitive pastures - ensure toxic weeds do not dominate. Control weeds with spray topping, crash grazing, spray-grazing and slashing (as indicated/practical). Ensure weed control includes laneways/yards and shelter belts; pay particular attention to soursobs around yards. Provide adequate hay if there is no option but to let hungry stock on weedy paddocks. Introduce slowly. Measure drench and antibiotic dosage rates accurately and drench strategically using faecal egg counts. FOR FURTHER INFORMATION: contact the Enhanced Abattoir Surveillance Program manager Dr Elise Matthews, your local veterinarian, livestock consultant or PIRSA Animal Health Officer.